At first glance, this short passage of scripture might seem like a simple recording of an event in Joseph’s, Mary’s and Jesus’ lives. But watch what happens when an old man enters the scene. 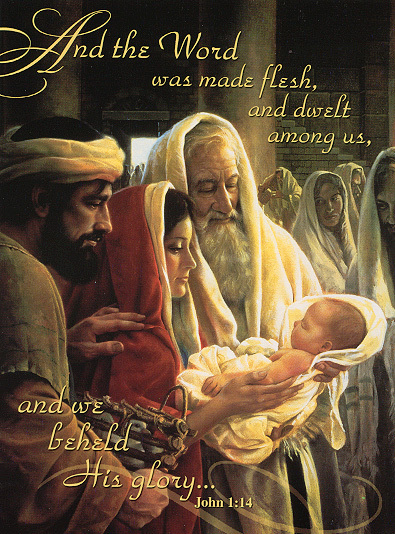 “Now there was a man in Jerusalem called Simeon, who was righteous and devout. He was waiting for the consolation of Israel, and the Holy Spirit was on him. It had been revealed to him by the Holy Spirit that he would not die before he had seen the Lord’s Messiah. Moved by the Spirit, he went into the temple courts. When the parents brought in the child Jesus to do for him what the custom of the Law required, Simeon took him in his arms and praised God” (Luke 2:25-28). “Sovereign Lord, as you have promised, you now dismiss your servant in peace. For my eyes have seen your salvation” (Luke 2:29,30). That baby was exactly what the old gentleman had been waiting for. When it’s time for me to pass from this earth, I hope similar words occupy my mind and heart, because I have also been blessed to see God’s salvation. That fact gives me peace. During this advent season, the coming of Christ reminds me there’s a wonderful hope for us. We have the promise of God’s glory when we know Jesus personally and trust Him as our Lord and savior. Like Simeon, we yearn to see Christ. We look forward to His return. One secret to Simeon’s story is this: he listened to the voice of the Holy Spirit and went to the temple when prompted. He knew from prior experience that the Spirit would speak. He anticipated the promise which was in line with his going. He trusted that he wouldn’t die before laying eyes on the Messiah. As I said, I’m blessed to know Jesus and His salvation. And like Simeon, I look forward to laying eyes on Him.